summer holidays | Damian Trasler's Secret Blog - Do Not Read! This summer holiday is likely to be the longest ever, since Christie Clark’s son doesn’t attend regular schools and so she doesn’t care how long the teachers stay on strike. That being the case, there’s a lot of time to fill in, so I borrowed the excellent “Unbored” book from my local library. 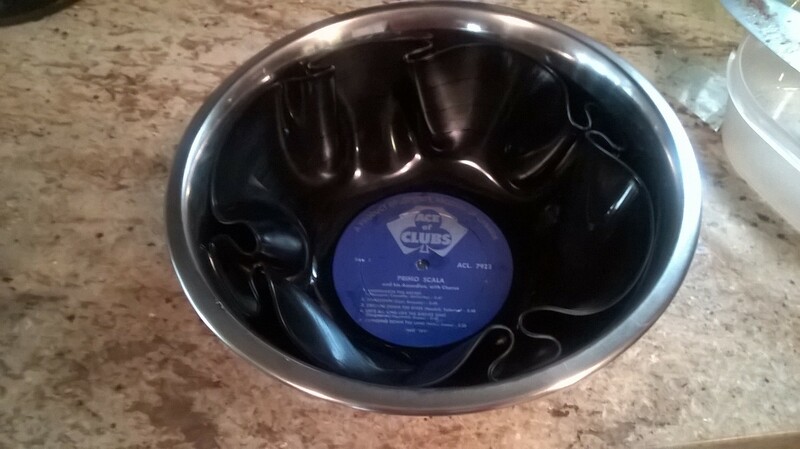 One of the many, many great suggestions for activities and entertainments was using old vinyl LPs to make bowls. 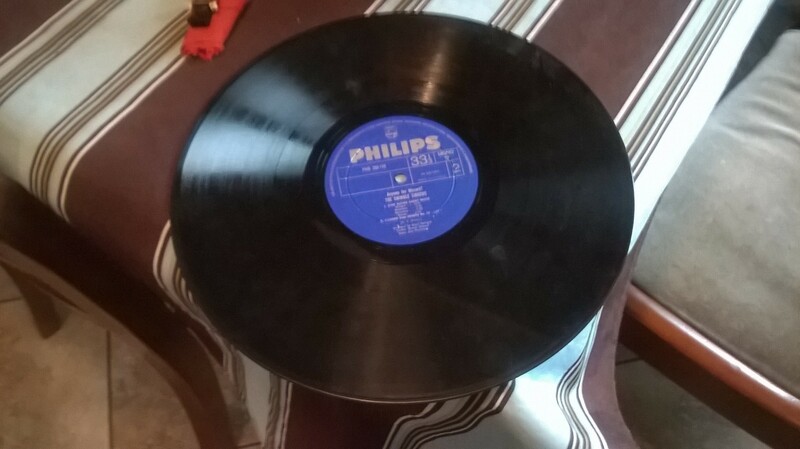 I know many guys my age argue passionately for the quality and brilliance of vinyl, intimating that it was somehow the zenith of sound recording and reproduction. I’m more of the opinion that it was easy to scratch, hard to find the track you wanted, prone to skipping and that the only positive was the size of the sleeve meant you got some pretty decent artwork. And no, I’m not a Pink Floyd fan. Take your ordinary LP. Wipe it clean. Pre-heat your oven to 200 degrees C. While you’re at it, you might want to open the window. A melting record smells a lot like burning plastic. Place the record on a small upturned bowl. 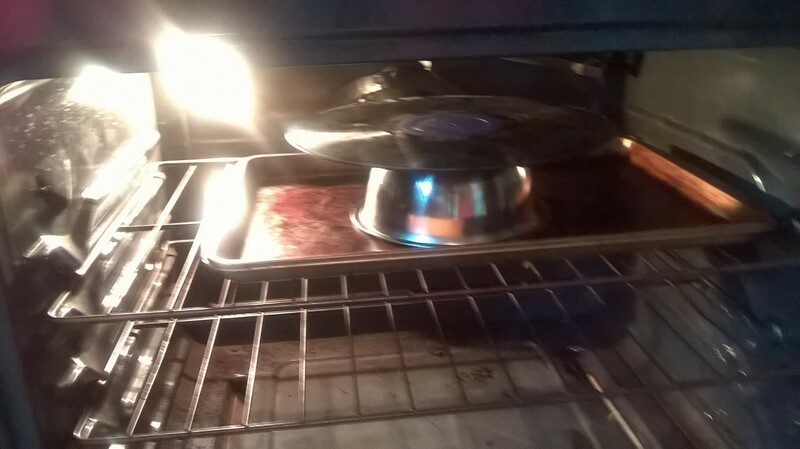 Place both record and bowl on a baking sheet and put them in the oven. Get a small child to watch through the window as the record slowly droops onto the bowl. Tell them this was what we did before there was TV. Take a second, larger bowl. 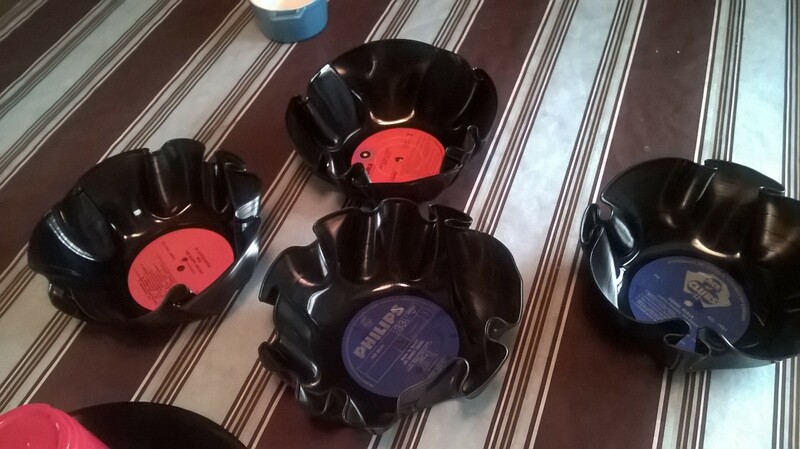 When the record has drooped sufficiently, hoik the entire collection out of the oven and place the big bowl over the record and small bowl, squashing it into shape. Flip over both bowls and remove the smaller bowl from the middle. Remember, it’ll be hot. Wear oven gloves (should I have mentioned that earlier?) and press the record to the edges of the bowl. Wait a couple of minutes. This would be a good time to tell the small child what records actually used to be used for. Turn out your new chip bowl. Or, in this case, FOUR new chip bowls. I don’t actually get to eat that many chips. Or listen to records, come to think of it. I really enjoyed this pointless activity, of turning something I didn’t use into something else I’m not going to use. Lucky for me, I added a couple of things to this week’s shopping list, so tomorrow I shall be helping the kids experiment with Mentos and Diet Coke. What could possibly go wrong?